(NaturalNews) Besides being one of my favorite recipe ingredients, I've always been a firm believer in the medicinal properties of garlic. An indispensable flavor in many foods, garlic also provides a wide range of health benefits in terms of prevention as well as treatment. Garlic has been used for thousands of years in treating dozens of illnesses and as a general health-boosting dietary ingredient. Modern science has shown that its chemical compounds have a measurable effect in fighting bacteria, viruses, fungi and protozoa. A recent study carried out by the Birla Institute of Technology and Sciences in India and published in the Pertanika Journal of Tropical Agricultural Science found that garlic can also be an effective treatment for the antibiotic-resistant strains of bacteria involved in many cases of urinary tract infection (UTI). According to the researchers, more than half of the 166 bacteria strains found in the urine of people with a UTI proved to be highly resistant to antibiotics. 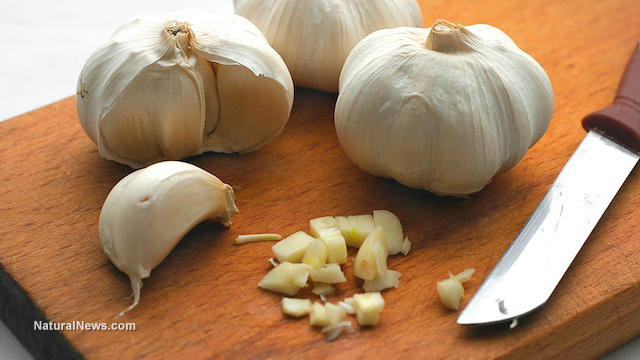 However, 82 percent of the resistant strains were wiped out by a simple garlic extract. In other words, the bacteria strains that have developed a resistance to antibiotics can be treated with a completely natural compound that has no side effects, costs almost nothing and will not create "resistant strains." The results are significant not only because garlic could indeed prove to be an effective alternative to increasingly ineffective antibiotics for treating UTIs and other conditions, but also because they illustrate an increasing recognition of natural medicine's relevance and validity among the medical establishment. The results of the present study support the use of natural products as affordable effective substitutes and/or additives for reducing the disease burden and overall cost of disease management. Drug-based treatments for many illnesses have shown to be either limited in effectiveness or completely ineffective when compared to natural treatments. Many drugs have side effects that are nearly as bad as the disease itself. Western medicine has allowed itself to become so influenced by Big Pharma that it is no longer an institution that promotes health and healing. Instead, it now appears to exist almost solely to generate profits for giant pharmaceutical companies. It is encouraging to see scientific studies that focus on the benefits of natural treatments. There is a place for pharmaceutical medicine, but I believe Nature provides a treatment or cure for almost every human illness or disorder. I also believe that natural foods are a major factor in preventive health and that garlic is one of the most important medicinal plants found in nature. As noted above, garlic has antimicrobial properties that make it effective in fighting viruses, fungi and other organisms. It can be used to treat and prevent colds, flu and infections, but garlic also provides several other health-boosting properties that make it one of nature's true "superfoods." Garlic is super-nutritious and loaded with vitamin B6, vitamin C, manganese and selenium. It also contains other minerals and vitamins in small amounts. Research has shown that garlic helps build and maintain a healthy immune system and can help to prevent many illnesses, such as colds. It also reduces the symptoms and duration of colds and flu by significant percentages. Among garlic's other benefits are its ability to lower blood pressure and cholesterol levels. The antioxidants found in garlic could be effective in preventing Alzheimer's and dementia as well as providing an anti-aging effect on human cells. Garlic has been shown to remove toxic heavy metals from the bloodstream, and there is some evidence suggesting that it promotes bone health as well. Garlic is wonderfully fragrant and flavorful in the kitchen. Easy to grow and inexpensive to buy, garlic is truly one of nature's miracle foods and medicines.